Here are just some of the photos sent in by you at home of Monday's storms and the damage they caused. 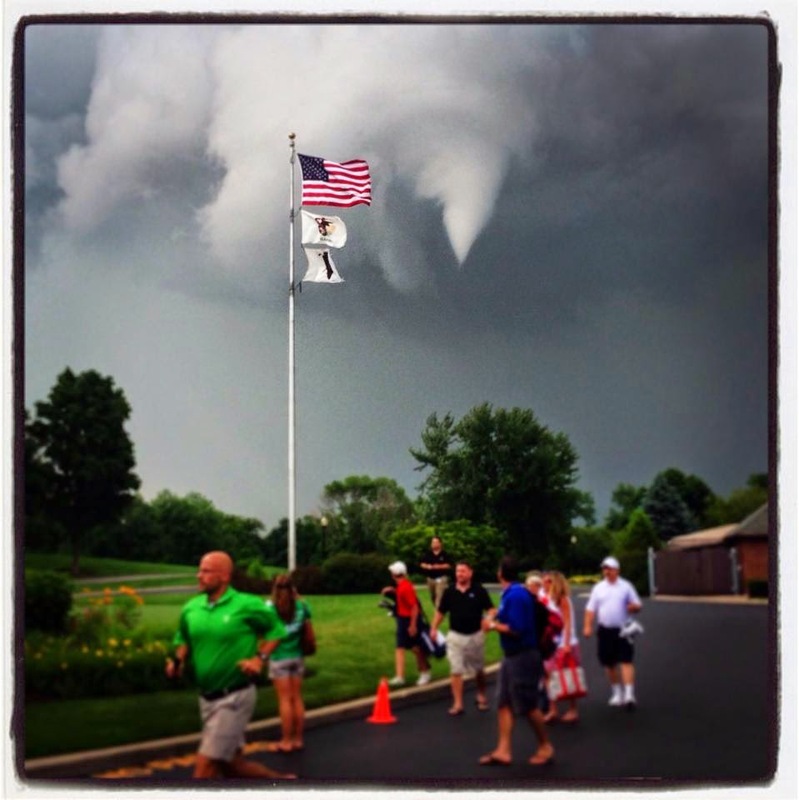 If you have any storm photos or reports, we'd love to hear from you. E-mail us at weather@wtvo.com. 10:25pm Update: All severe thunderstorm watches and warnings are done for the night, but a Flash Flood Warning will continue for Winnebago, Ogle, and Lee until 1:30am and Stephenson, Carroll, and Whiteside until 2:30am. 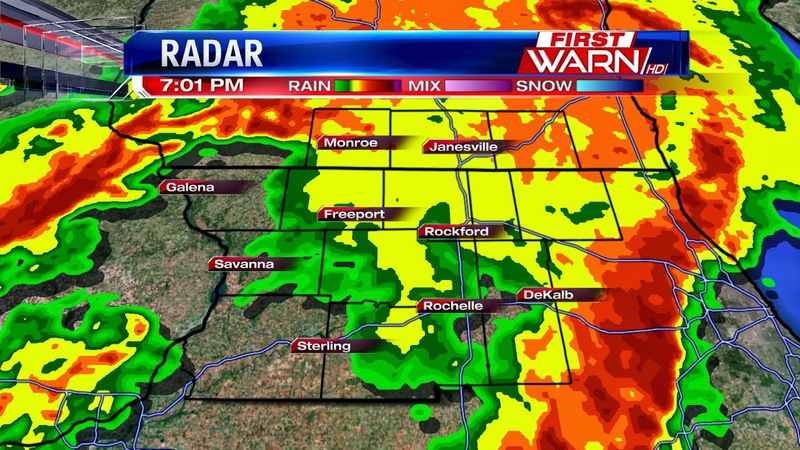 9:30pm Update: All warnings have been allowed to expire for the Stateline. Here's a look at some of the storm reports we've received from this evening's second round of storms. Amboy: Nickel-size hail and downed trees. Rockford Airport: 56mph wind gust. 8:55pm Update: Severe T-Storm Warning for E Boone, McHenry, DeKalb, and E Lee until 9:30pm. 60mph winds & quarter-sized hail possible. 8:40pm Update: Severe T-Storm Warning for S Winnebago, S Boone, NW DeKalb, Lee, and Ogle until 9:15pm. Warning includes the city of Rockford. 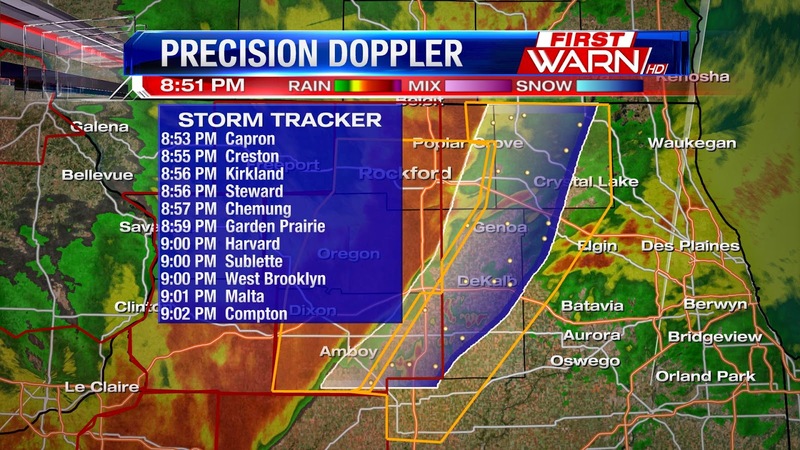 Storms capable of 60mph winds and quarter-size hail, especially in Ogle County. 7:40pm Update: No watches or warnings are in effect at the moment. More storms are moving in from the west, but any severe threat should stay closer to the Quad Cities. 7:00pm Update: Our power is back on at the station! Sorry for the inconvenience. Here's the latest. A Severe T-Storm Watch continues for McHenry until 9:00pm, but the storms that prompted this evening's watches and warnings are now pushing east and out of the viewing area. A few storms will still be possible through midnight, but the severe threat looks minimal for the rest of the night. 5:15pm Update: Severe T-Storm Warning for Rock and Walworth until 6:00pm. 60mph winds and penny-size hail possible. Line of storms moving through southern Wisconsin and north-central Illinois moving east/northeast between 45-50 mph. Here's a list of cities that will be impacted as this line of storms continues to move through. Seek shelter, away from windows as storm winds could reach 70 mph. 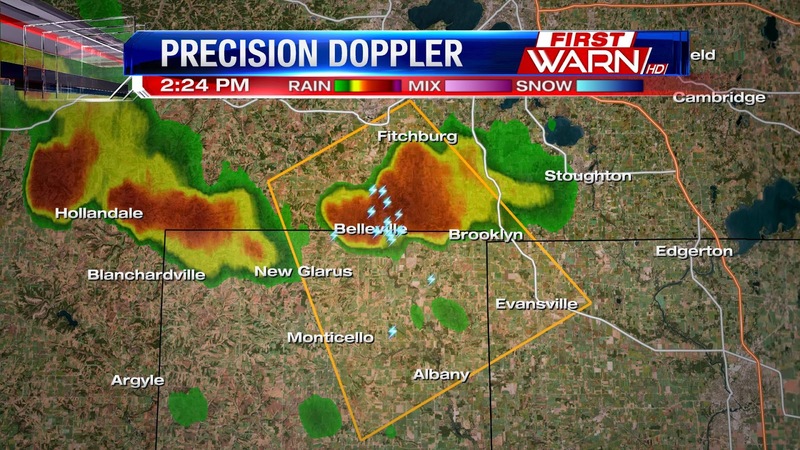 Severe Thunderstorm Warning for Green and Rock counties in southern Wisconsin until 5:15pm. 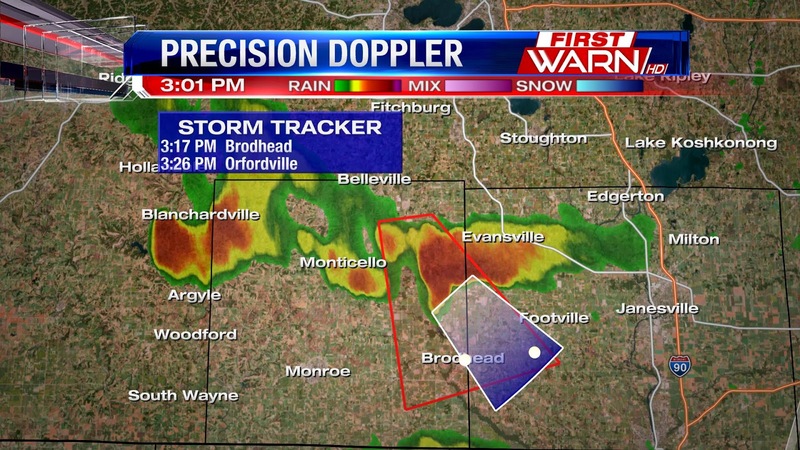 Storm is currently in western Green County just west of Monroe and moving northeast at 50 mph. 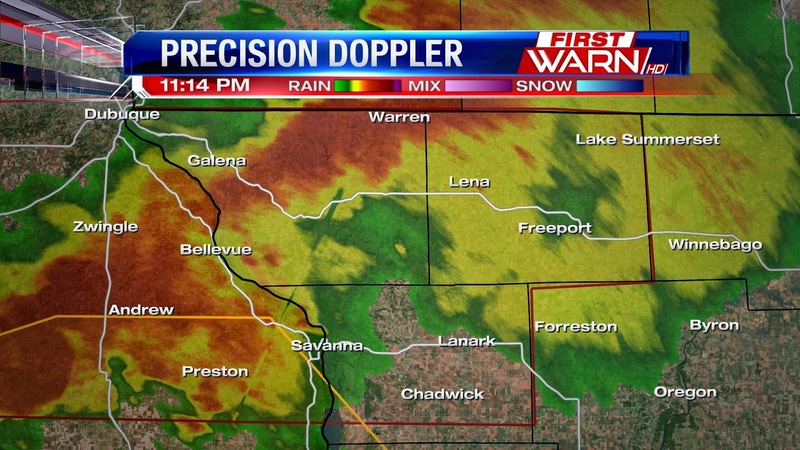 Severe Thunderstorm Warning for Jo Daviess, Carroll and Whiteside counties until 4:30pm. Storm is moving to the northeast at 85 mph! Storm will be capable of producing winds in excess of 70 mph. 3:35pm Update: A Severe T-Storm Watch is now in effect for Walworth (WI) and McHenry (IL) until 9:00pm. 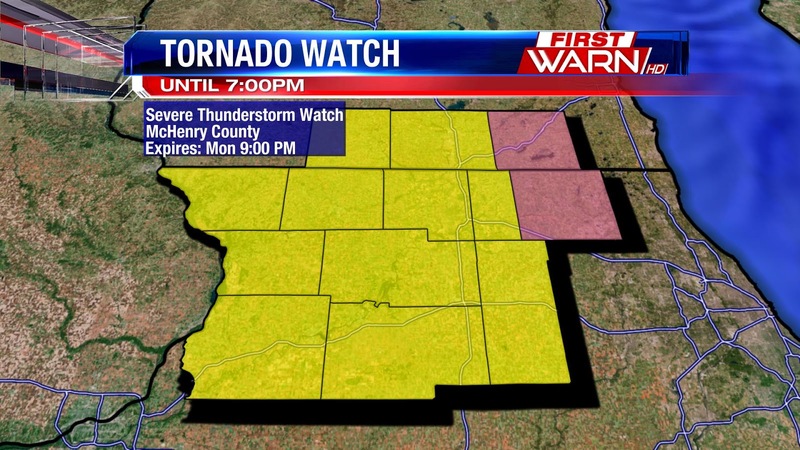 Tornado Watch continues for the rest of the Stateline until 7:00pm. 1:30pm Update: A line of thunderstorms has started to develop in central Iowa and will begin to gain a little more forward speed as they move into eastern Iowa. 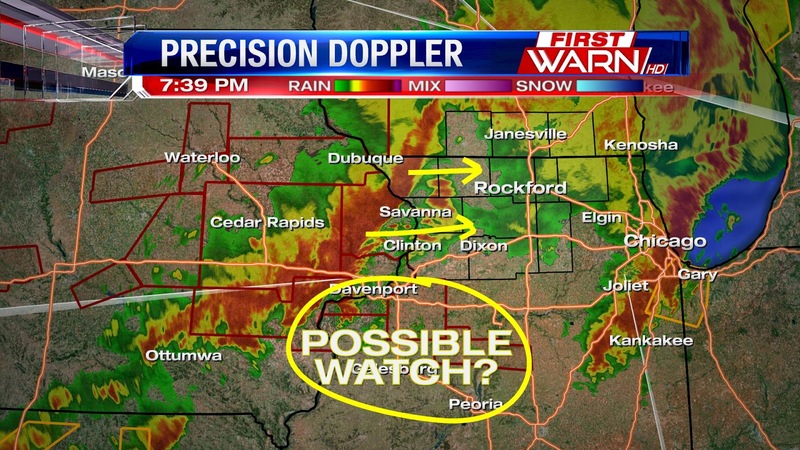 Right now, there are no active watches or warnings out for northern Illinois or southern Wisconsin, but that will likely change as we head into the afternoon. Timing of storms looks pretty much on as to what we've been saying throughout the morning: north-central Illinois and southern Wisconsin between 3pm and 6pm, extending out towards Chicago after 8pm. Should storms gain forward speed as they move through Iowa, they will be moving fairly quickly at speeds roughly around 60mph. This would mean that there wouldn't be a lot of time to react if a warning were issued. Now is the time to have a plan in place for severe weather. Know where to go if a warning is issued for your county. We'll continue with further updates throughout the afternoon as needed. 1:00pm Update: Weather briefing with the Chicago National Weather Service is about to begin shortly. Will provide updates throughout the conference call. There remains a decent amount of cloud cover in northern Illinois and southern Wisconsin this morning, but looking at the most recent visible satellite image shows some clearing beginning to take place further west. The weather and skies will remain quiet through at least early afternoon as the atmosphere will need some time to 'recharge' after last night's thunderstorms. Thunderstorms have redeveloped back west in Nebraska and western Iowa closer to a cold front, outflow boundaries and low pressure. The image on the left is a look at the CAPE, Convective Available Potential Energy, within the atmosphere. This is how much 'energy' the atmosphere has to work with when generating thunderstorms. Right now, the greatest instability is to the south where thunderstorms have been lacking through the morning, however, thunderstorms have been riding just to the north of that axis and are currently moving east. As we begin to peel away at the cloud cover through the afternoon, the instability is expected to rise further into Illinois and Wisconsin. Right now, the greatest timing for storms appear to be between 3pm/4pm in eastern Iowa/northwest Illinois and 6pm in north-central Illinois. 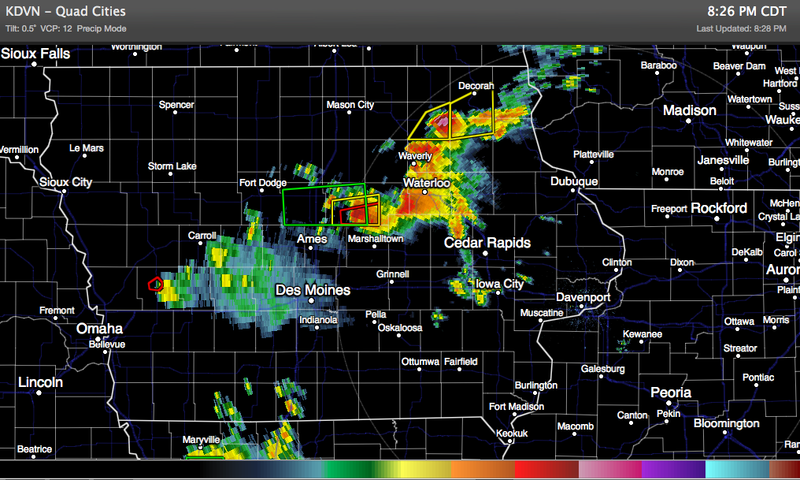 The tornado threat will remain highest in Iowa as individual storms develop. As the storms move east, they will form into a big cluster or even a strong line of storms with damaging winds becoming the main concern. The storm threat will diminish after 11pm to the east as a cold front and low pressure move through. 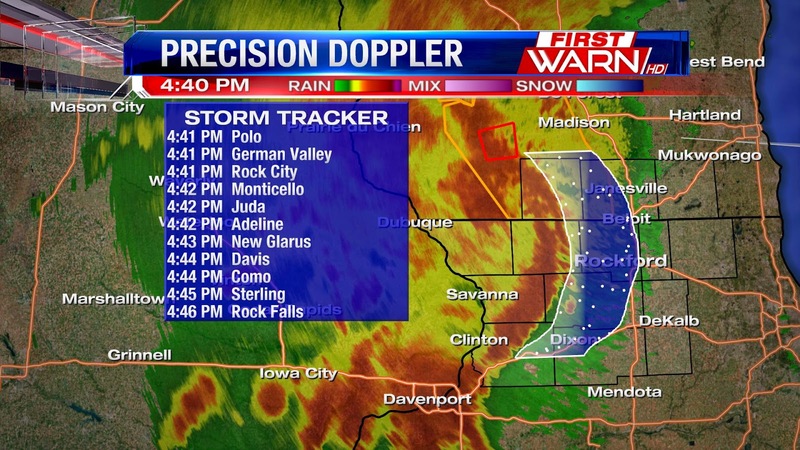 The overall timing of thunderstorms for the Stateline looks to be roughly between 4pm and 11pm. As storms continue to develop out west and clouds begin to slowly clear, we'll continue to provide updates throughout the day. 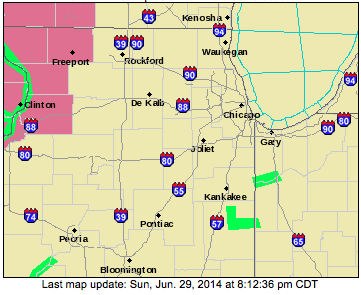 A Flash Flood Watch remains in effect for most of northern Illinois through Tuesday morning. 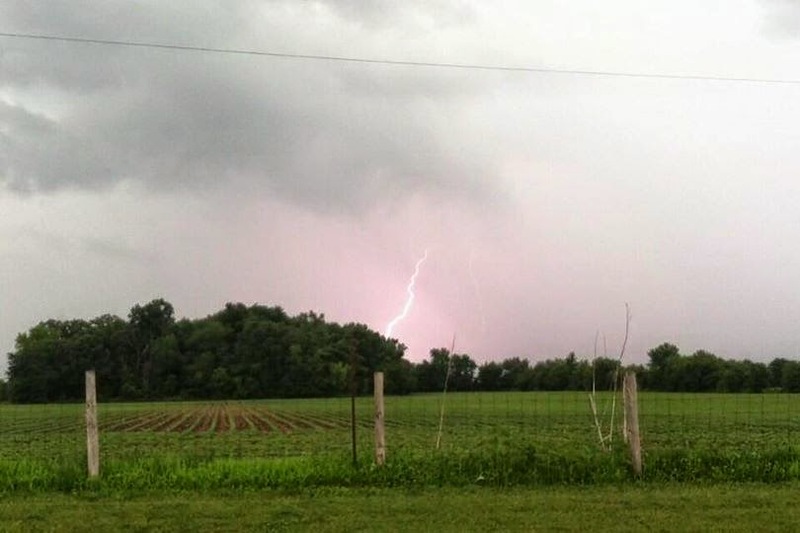 Strong thunderstorms rolled through eastern Iowa and northern Illinois late Sunday night and early Monday morning producing anything from extremely heavy rain, damaging winds, tons of lightning and even tornadoes. While we've got a little break from the activity early this morning, the thunderstorm threat will really ramp up going into the late afternoon and evening. The Storm Prediction Center has highlighted northern Illinois and southern Wisconsin under Moderate Risk for severe weather as it looks like things are coming together for a potentially significant damaging wind event rolling through the Stateline this evening and early overnight. I'm currently working on a complete analysis and will have a detailed update for you coming up shortly! 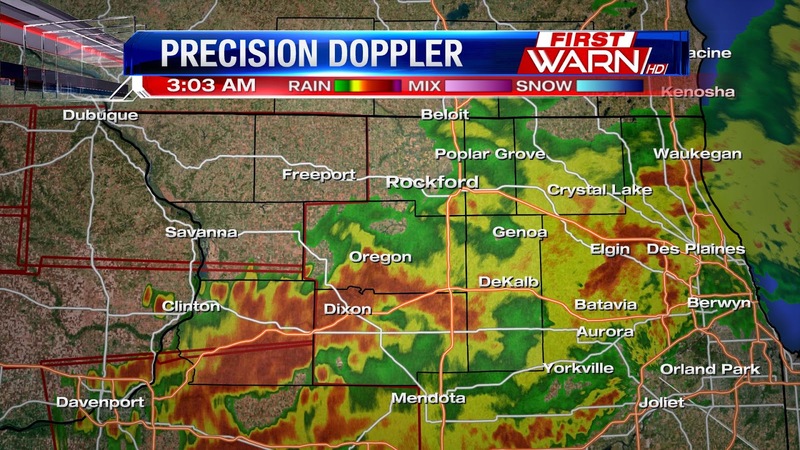 6:55am Update: The severe storm threat has gone down across the Stateline. Showers in eastern Iowa pose much of a severe weather risk, however there has been a severe thundrstorm warning for one cell in eastern Iowa. While a few showers are expected here this morning, it will be what forms later this afternoon and evening that will pose the greatest severe weather risk. I'll have more on that coming up later this morning. 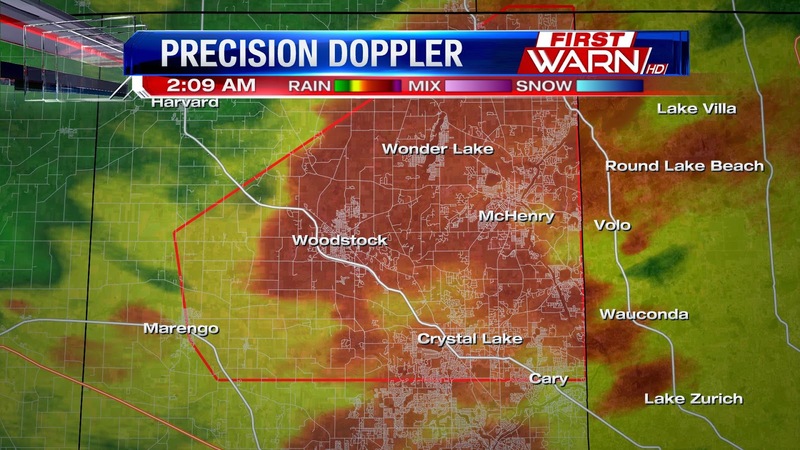 The Tornado Warning for McHenry County has been allowed to expire at 2:30am. The storm has weakened and has not shown anymore signs of strengthening. 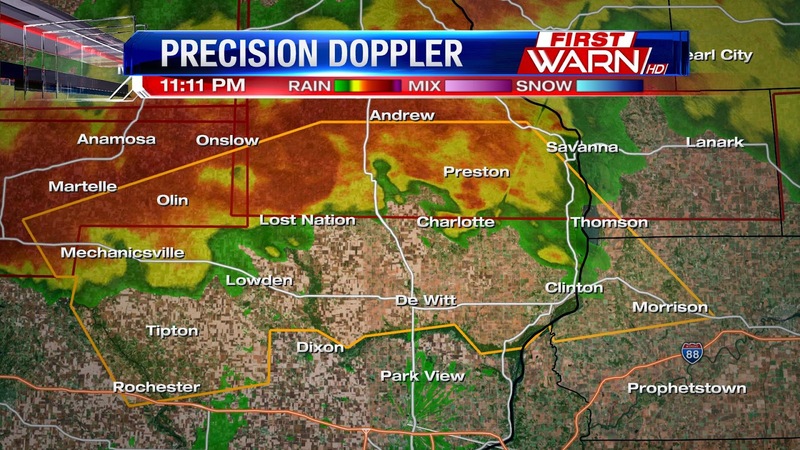 Also, the Tornado Watch for Jo Daviess, Carroll, Whiteside and Stephenson counties has been allowed to expire. I wouldn't be surprised to see the Tornado Watch cancelled further east as well once these storms move out. Currently, there are no active warnings in place, just a lot of heavy rain and lightning. Tornado Warning for McHenry County until 2:30am. 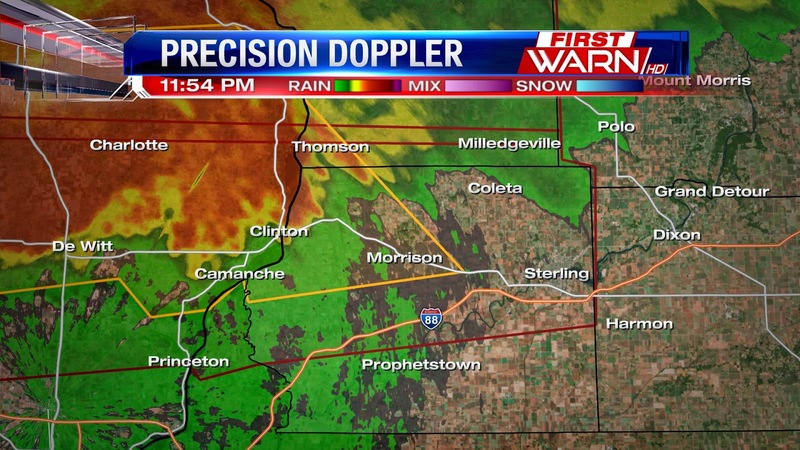 Doppler radar indicated rotation within this thunderstorm near Marengo shortly after 1:45am. This storm is moving to the northeast around 35-40 mph. Cities impacted will be Crystal Lake, Woodstock, Bull Valley and McHenry. Get into the lowest level of your home or in a basement. 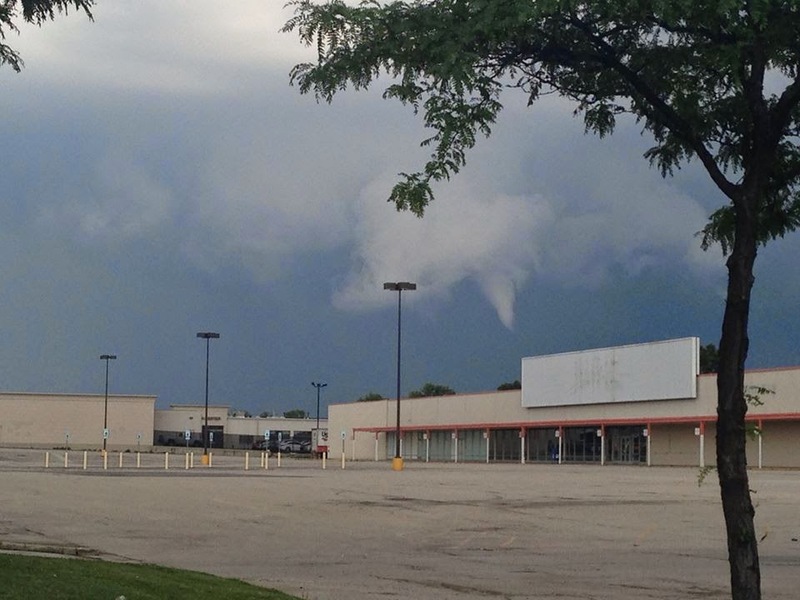 This storm was reported with a funnel cloud from a storm chaser. Severe Thunderstorm Warning for Ogle, Lee and DeKalb counties until 2am. A line of thunderstorms over I-39 continues to move east around 40-45 mph. 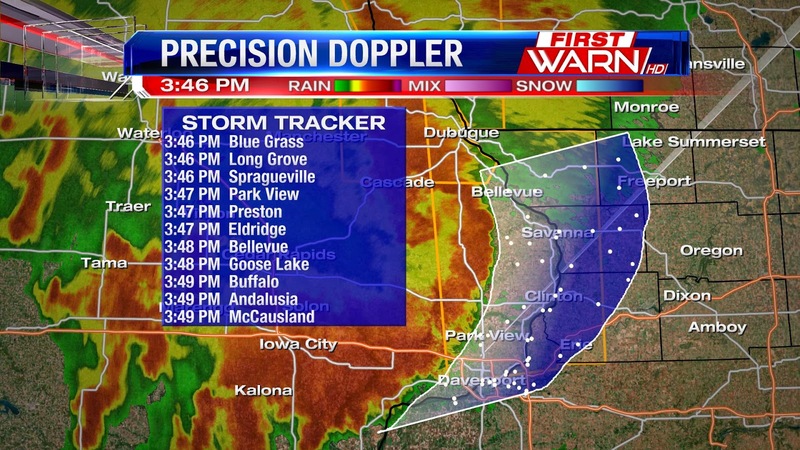 This line has had a history of producing damaging winds in eastern Iowa as well as western Illinois, although within the past 10 minutes it has begun to show some signs of weakening. We'll continue to monitor this storm as it moves to the east . 1:10am Update: Severe thunderstorms continue to roll through Winnebago & Boone with significant, heavy rain along with frequent lightning as well as strong winds. 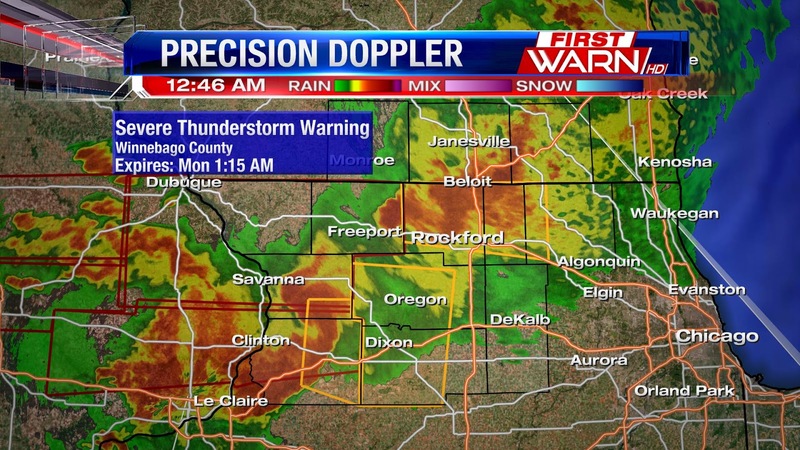 Severe Thunderstorm Warning continues for Ogle & Lee counties until 1:30am. Winnebago, Boone, western McHenry until 1:15am. Southeast Carroll and eastern Whiteside until 1:15am. Ogle and Lee until 1:30am. 11:55pm Update: New Flash Flood Warning for southern Carroll County and all of Whiteside until 5:45am. 11:15pm Update: Severe T-Storm Warning for SW Carroll and NW Whiteside until 12:00am. Penny-sized hail and 70mph winds possible. 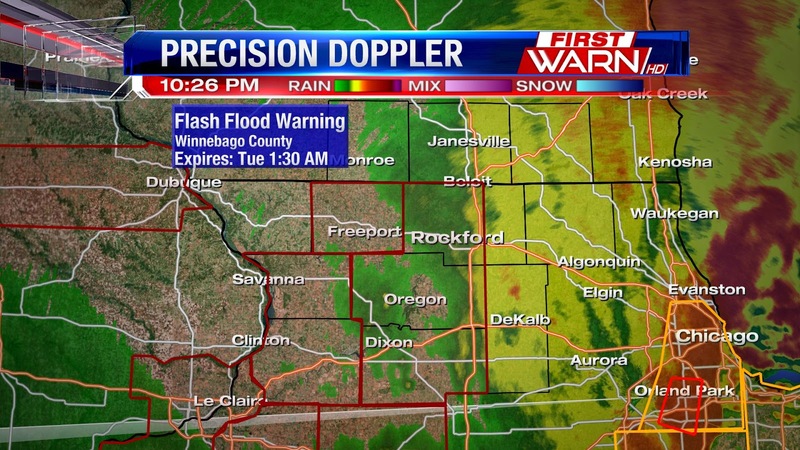 A Flash Flood Warning is in effect for Jo Daviess, Carroll, and Stephenson until 5:15am. 11:00pm Update: Tornado Watch is in effect for the entire Stateline until 4:00am. No warnings at this time. 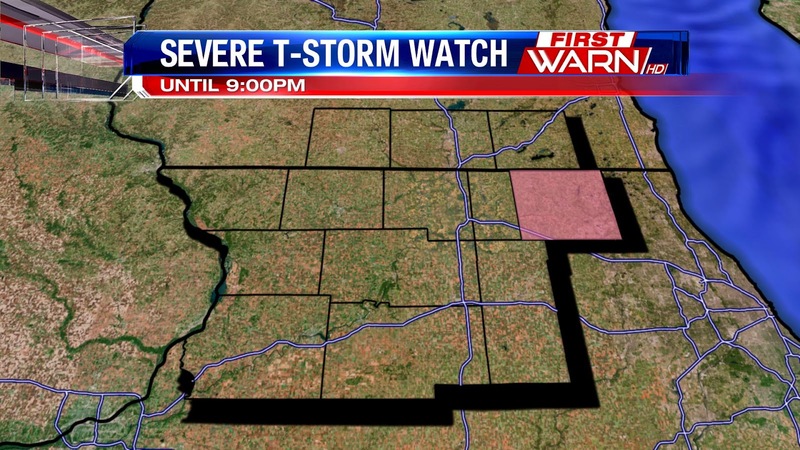 8:30pm Update: A Severe T-Storm Watch is in effect for Jo Daviess, Carroll, Whiteside Stephenson Counties in Illinois and Green County in Wisconsin until 3:00am. 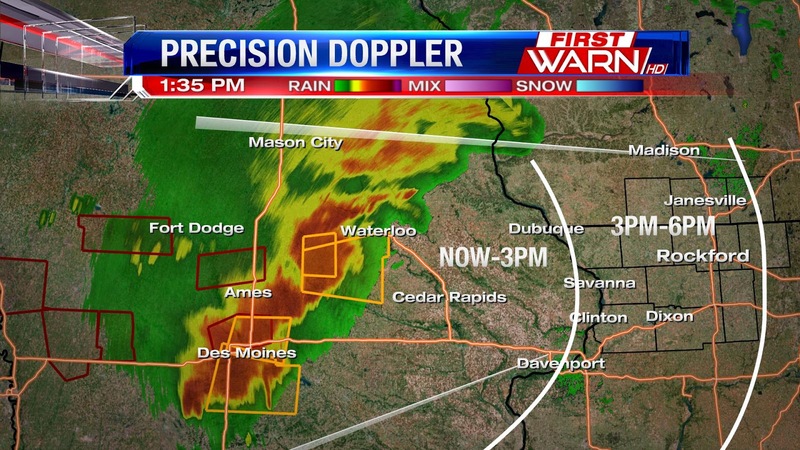 Severe storms are currently in Iowa and will take a few hours to push into the Stateline. The thunderstorm threat continues into the weekend just as temperatures and humidity will be on the rise. Greatest threat for thunderstorms today will be across the Plains with isolated thunderstorms firing up this afternoon in the Stateline with the heating of the day. Strong jet stream winds will slam into the Plains and upper Midwest through the weekend pushing the storm threat further east. Similar to Friday, Saturday's weather will feature pop-up, isolated thunderstorms through the afternoon. However, there could be a few early in the day with the passage of a warm front. 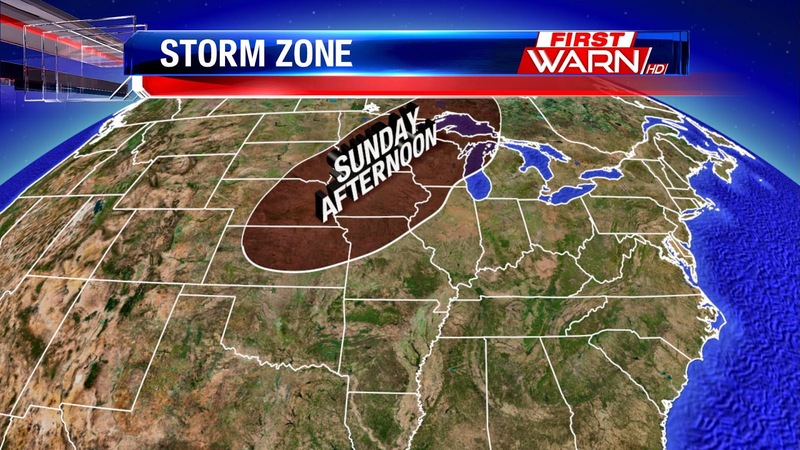 The storm threat will increase Saturday night and Sunday morning and then again Sunday late into Sunday night. With the heat and humidity building through the weekend, strong to severe thunderstorms will be possible. Stronger storms are more likely Monday with a cold front. 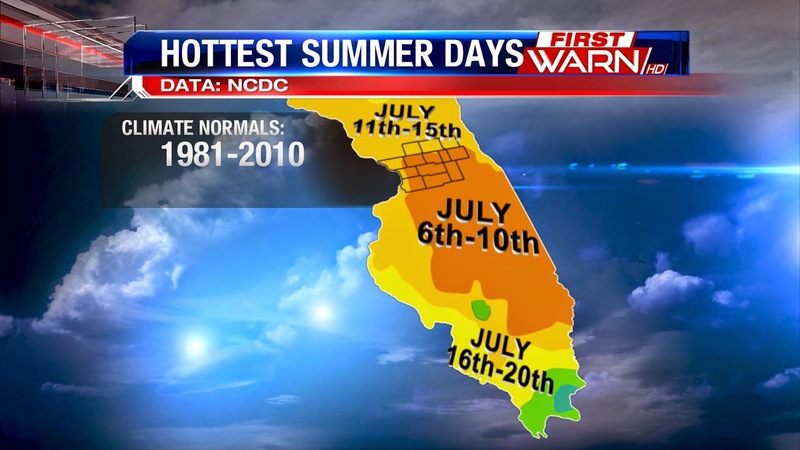 When looking at temperatures from a climatological view, July is when we typically experience the warmest summer days. Of course, growing up in northern Illinois and southern Wisconsin we know that this can happen really anytime during the summer months. But on average, the beginning to middle of July is when we experience the heat with an average temperature of 85 degrees. The National Climatic Data Center released some interesting information this week on when the United States, on average, experiences it's warmest temperatures. This is looking at the average daily high temperature over a 30 year period; from 1981-2010. Looking at the data, much of northern Illinois experiences the warmest temperature during the first to second week of July. The further north you head into Wisconsin, the warmest temperature is experienced roughly a week later. What's really interesting to note with the map on the left is how variable the climate is across the United States. This is due to different factors influencing the temperature from coast to coast. Although the amount of solar radiation reaching the earth peaked at the summer solstice on June 21 in the Northern Hemisphere, temperatures for most of the United States tend to keep increasing into July. The temperature increase after the solstice occurs because the rate of heat input from the sun during the day continues to be greater than the cooling at night for several weeks, until temperatures start to descend in late July and early August. But, this isn’t the case everywhere! The “Warmest Day of the Year” map shows just how variable the climate of the United States can be. For instance, the June values in New Mexico and Arizona reflect the North American Monsoon, a period of increased rainfall affecting the Southwest United States. Because these areas tend to be cloudier and wetter from July through September, the temperature is highest on average in June. Similarly, the persistence of the marine layer along the Pacific Coast leads to cool temperatures in early summer with the warmest days on average later in the season. Temperature Normals are important indicators that are used in forecasting and monitoring by many U.S. economic sectors. Knowing the probability of high temperatures can help energy companies to prepare for rising electricity demand and farmers to monitor heat-sensitive crops. They are also useful planning tools for the healthcare, construction, and tourism industries. You may want to check the Normals before planning your next event or vacation. 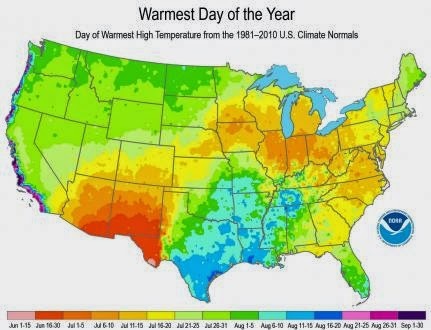 While the map shows warmest days of the year on average throughout the United States, this year’s actual conditions may vary widely based on weather and climate patterns. For prediction of your actual local daily temperature, and to see how it matches up with the Climate Normals, check out your local forecast at Weather.gov. "It has rained every day for almost two weeks. Can you find out how much rain the Rockford airport has reported for the last two weeks and when we might have a whole day without rain." Well Gary, it probably won't be until next week when we'll go completely rain free, but you are almost correct for the number of days in a row it has rained. Rockford has recorded a trace of rain or more for the past ten days, and today will likely make eleven. The highest rainfall amount came on the 19th when over an inch and a half was recorded at the airport. Adding up all the rain over the past ten days adds up to over four inches! This puts our monthly rainfall total at 6.20", a good surplus of 2.24" for the month of June! To put this into perspective, the last time we had rainfall for ten straight days was April 13th-22nd, 2011. The last ten straight days with any precipitation, including snowfall, was April 8th-19th, 2013. Now, over the course of the next several days, we will continue to add up the rain as the wet and muggy pattern continues. Will we see those heavy downpours like we have in the past? It's possible, but the rain looks more scattered with thunderstorms popping during the heating of the day. Keep in mind, there have been some locations that have seen more than this and some that have experienced a lot less. 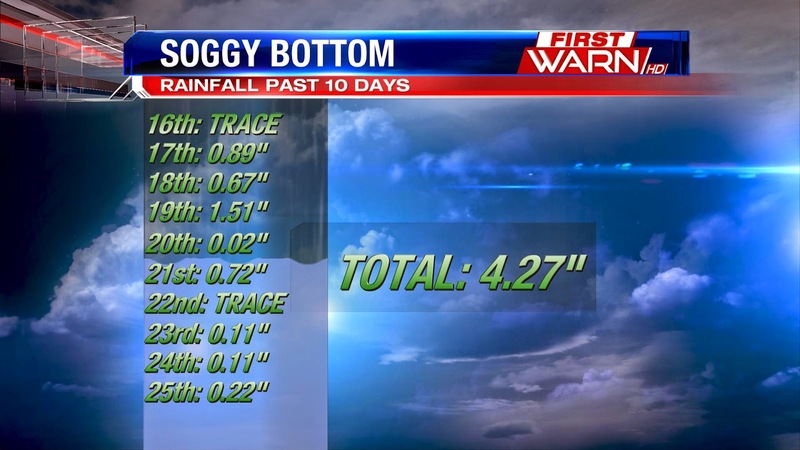 The rainfall over the past week and a half has been anything but uniform, but it sure is keeping the ground saturated. By the middle of next week, it looks like the pattern will begin to break and we'll dry out as high pressure moves back in. 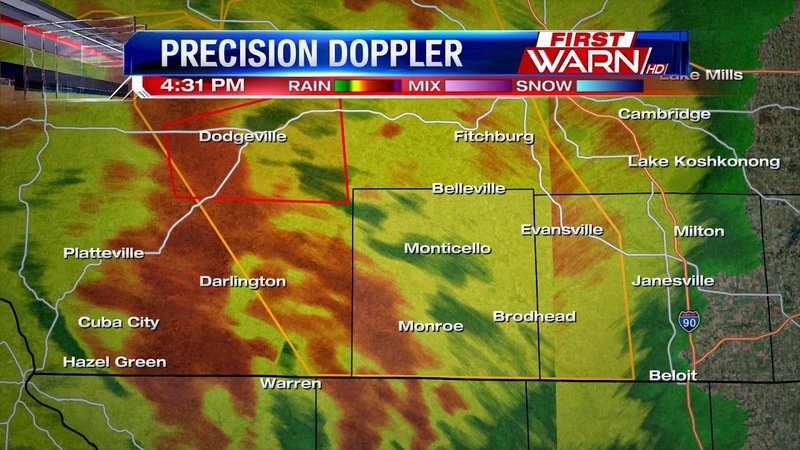 Tornado Warning issued for Green and Rock counties in southern Wisconsin until 3:15pm. Radar indicated weak rotation within this storm just northeast of Albany, WI. Seek shelter immediately. Storm is tracking southeast around 20 mph. 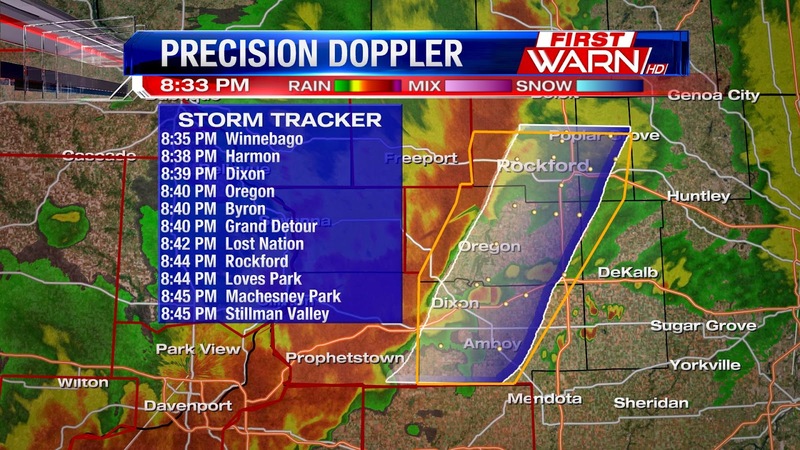 2:25pm Update: Severe T-Storm Warning for northeast Green & northwest Rock Counties (WI) until 3:00pm. Quarter-sized hail & 60mphs wind possible. The weather has stayed pretty quiet so far this morning, but a weak surface front draped from southern Wisconsin and northern Illinois could be the focus for thunderstorms late this afternoon. An upper level low spinning through central and southern Wisconsin will interact with the boundary and with the heating of the day, I anticipate thunderstorms to become a little more widespread after 2pm. While we won't see a high threat for severe weather today, there does remain the threat for storms to produce large hail and locally strong winds. Here is the technical discussion from the Storm Prediction Center. 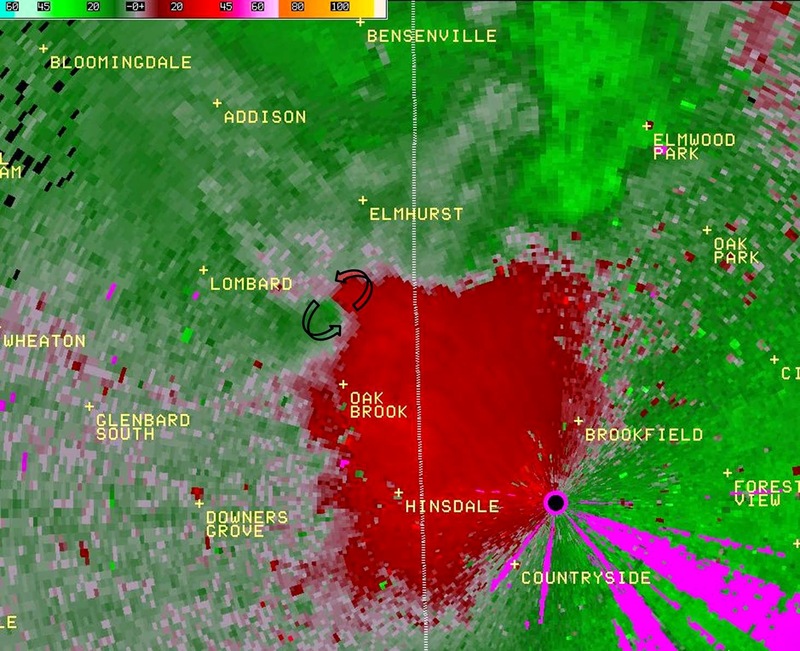 ORD Doppler Radar showing the cloud based rotation. There are multiple elongated boundaries that intersect and storms develop on these. 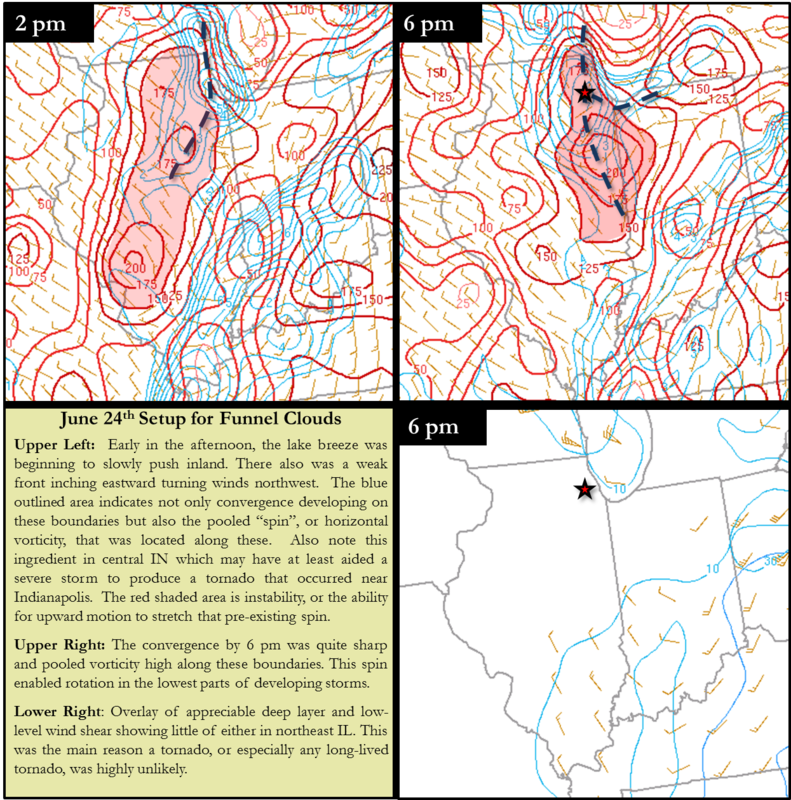 The updrafts of these developing storms stretched pre-existing low-level "spin" and helped produce the funnel clouds. A couple weak fronts sliding through Wisconsin and Illinois the past few days has slowly, and I mean slowly, lowered the humidity. However, we're not going to completely get rid of it and as we look towards the weekend, it will only increase. Thunderstorms today will be most likely in Wisconsin closer tied to an area of low pressure, but with the heating of the day and northern Illinois being in close proximity to the low, I'm going to hold on to a higher threat for storms later this morning and early afternoon. Severe weather isn't expected, but heavier rain along with hail and stronger wind gusts are possible with any storms that do form. Once the sun begins to set this evening, the storm threat will decrease. 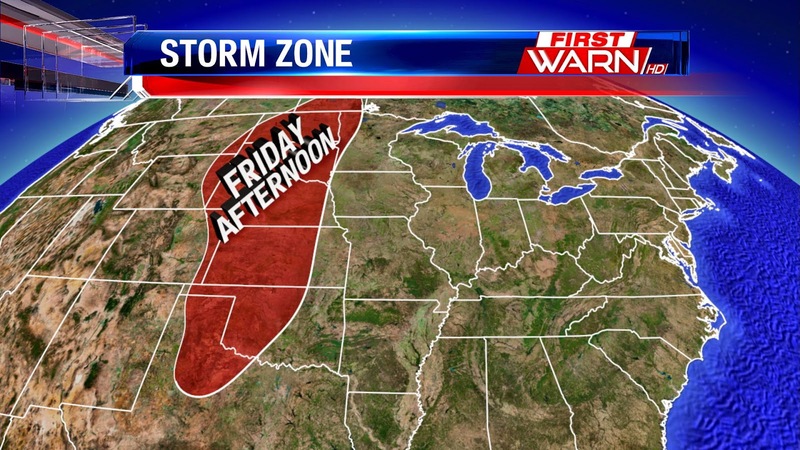 Isolated storms will continue through the weekend as the jet stream pattern begins to shift a bit. As we head closer to the weekend, it looks like we'll develop more of a southwest to northeast flow within the jet stream. 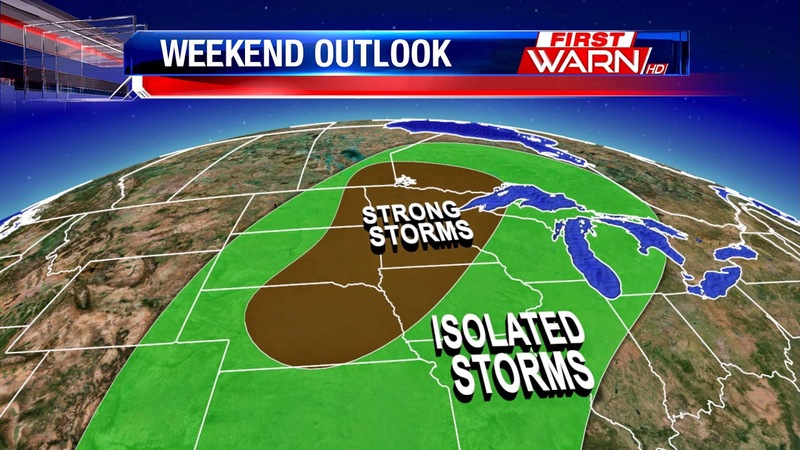 This means big thunderstorms are going to be possible across the far northern Plains and upper Midwest Saturday and Sunday. Isolated thunderstorms continue for southern Wisconsin and northern Illinois for the weekend, but if we see many dry hours - especially on Saturday - temperatures will have a good chance of reaching near 90 degrees! It does look to be an active start to next week, but the pattern begins to break down after we get past Tuesday. Hopefully a drier pattern will hold through the 4th of July. Weather 101: What Is An Omega Block? If you've seen the forecast, you've noticed we have a lot of little storm chances the next several days, but why is that? One thing we can blame is the overall weather pattern and the formation of an Omega Block over the coming days. So what the heck is an Omega Block? The simple answer is it's an area of high pressure that's stuck between two areas of low pressure. This causes the jet stream to kink, making it look like the Greek letter Omega (thus the name). This pattern can stick around for several days and can make the forecast very repetitive. The week of June 22-28 is Lightning Safety Awareness Week. On average, lightning kills about 51 people a year, but injures hundreds more. Here are a few tips to stay safe during the peak season for one of Mother Nature's more deadly phenomena. GET INSIDE: You've probably heard the phrase, "When thunder roars, go indoors". That's because if you can see lightning or hear thunder, you have the potential of being struck. OUTDOOR ACTIVITIES: If you have outdoor plans and see lightning or hear thunder, the best advice is to wait 30 minutes after the last rumble of thunder before going back outside. 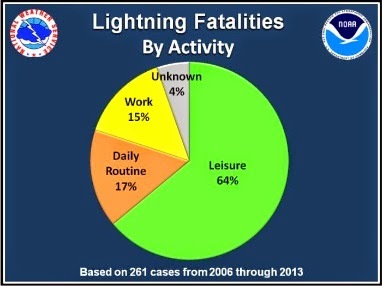 The majority of people who are killed by lightning each year are doing leisure activities, like fishing or boating. 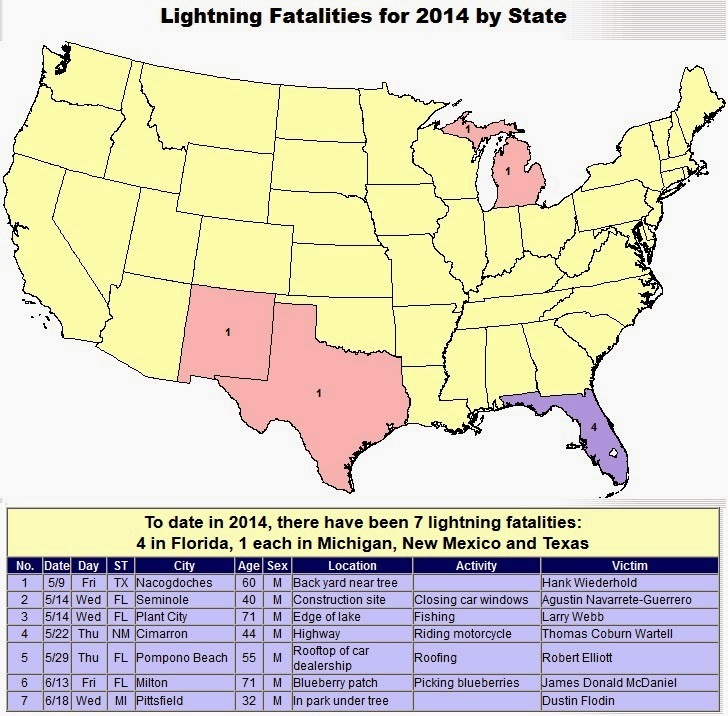 So far in 2014, seven people have died from lightning strikes. 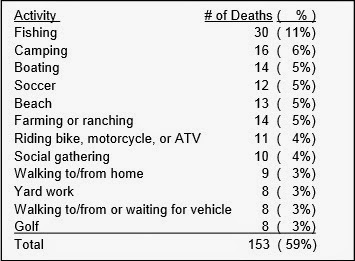 If you look at what those people were during when they were killed (Fishing, riding their motorcycle, etc. ), you realize that most of those deaths could have been prevented.